The sixth step is a bit more complicated than the previous ones: Use keywords to sort your images. I often see photographers sort their images by creating separate folders based on the subject of the photograph. For example, I was recently helping a someone organize a chaotic mess of 100,000 image files. This photographer, instead of organizing the images chronologically, organized them by subject with each subject in a different folder. There was a folder for birds as well as one for eagles, hawks, and backyard birds; there was a folder for family as well as separate folders for each member of the family; there was a folder for vacations as well as folders for many states. And, there were duplicates galore because, if an image was of the photographer’s teenage son, a copy went into the folder for family pictures and into the folder named for the son. It was a mess! 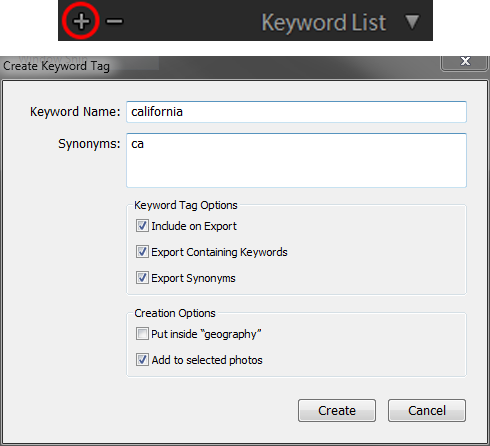 Screenshot 1: The Keyword List panel in Lightroom is the starting point for assigning keywords. From this panel, you can create, edit, or delete keywords, assign keywords to an image or images, and rearrange the hierarchy of keywords, and search for images with a specific keyword. While I remain committed to the idea that you can choose any system of folder and file naming that works for you, this type of organization works for no one. Why? Because you can’t keep track of your images this way. Which image of the multitude of duplicates is your master image? If you make a habit of only adding each image to one folder, how do you know whether the image you are looking for is not in a different folder? If you dump all your images from New Mexico into a single folder, what happens when you want to look at the images from New Mexico from the trip in 2012? In the third posting in this series, I recommended that you store your photographs by date regardless of the subject and, now to help you find all your images in those chronologically arranged folders, I recommend that you tag your images with keywords. You don’t need to add 20 keywords to each image; you only need enough keywords to differentiate images. For example, an image of me hiking in Muir Woods in northern California could be tagged with “Brian,” “Muir Woods,” “California,” “Mill Valley,” “vacation,” “coastal redwoods,” “Douglas fir,” “afternoon,” “green,” “hiking,” and “photography.” However, I can really limit the keywords to brian, muir woods, mill valley, coastal redwoods. Why? Because these are the keywords that I am most likely to search for when looking for images. So, you can see that which keywords you assign is really somewhat dependent on what it is you are doing with your images. Set up at least a small list of keywords before you begin assigning keywords. It doesn’t need to be a complete list at this point because you can add more keywords as you are adding keywords to images. However, it is helpful to have a basic structure. For example, for locations you might create a set of keywords as follows: geography > north america > united states > virginia and then add cities under virginia as they are needed for keywording. Create keywords using the words that you would use. For example, use woodpecker instead of Picidae, the scientific name for woodpeckers. Always verify the keyword or a similar one isn’t already in the keyword list. You don’t want multiple keys for the same subject, e.g., bears and coastal brown bears. Use one and stick with that keyword. Use capitalization consistently for readability. It doesn’t matter whether proper nouns are capitalized; Lightroom ignores capitalization. Screenshot 2: Click on the + (plus) sign to display the Create Keyword Tag window. Create a keyword by entering the name of the keyword and any synonyms, checking the desired options, and clicking on Create. If the keyword ends up in the wrong place in the heirarchy, simply drag and drop it to the correct location. Lightroom will handle all the mechanics and any images assigned the keyword will be updated automatically. Screenshot 3: When the cursor is rolled over “air sports,” a small checkbook appears to the far left of the keyword. Click the box to assign the keyword. One final suggestion, add keywords to your images before you start processing the. If you don’t, you will never add them and really just a few keywords will make finding your images much easier. Editor’s Note: In early May, Brian started a series of ten posts each outlining one or more simple but small things you can do to speed up your Lightroom workflow. This is the sixth post in that series; the first post was about how to efficiently manipulate Lightroom’s interface to reduce clutter; the second about the improving your efficiency inside Lightroom by using context menus; the third about how to name folders; the fourth about how to name image files; and the fifth about using keyboard shortcuts. 13 Jun	This entry was written by School of Creative Photography and published on June 13, 2014 at 10:27 pm. It’s filed under Editing Images and tagged editing, keyword list, lightroom, raw. Bookmark the permalink. Follow any comments here with the RSS feed for this post.